My partner’s mother had a spare ticket to see our local production of Anything Goes, my partner’s Father isn’t a musical fan and was eternally grateful I let him off the hook. However, a trip to the theatre needs a new dress. A rummage through my filing cabinet and I came up with Simplicity 1354BB. It’s part of their ‘Amazing Fit’ range. I picked it up during one of Spotlight’s pattern specials. They have some great options for those with a bigger bust. I however, fit comfortably in a C cup. As someone shortwaisted I should have taken the option to shorten the waistline, however didn’t (something I regretted later). I picked up the fabric during a Spotlight shopping trip with my mum (she is a worst fabric horder than I am). 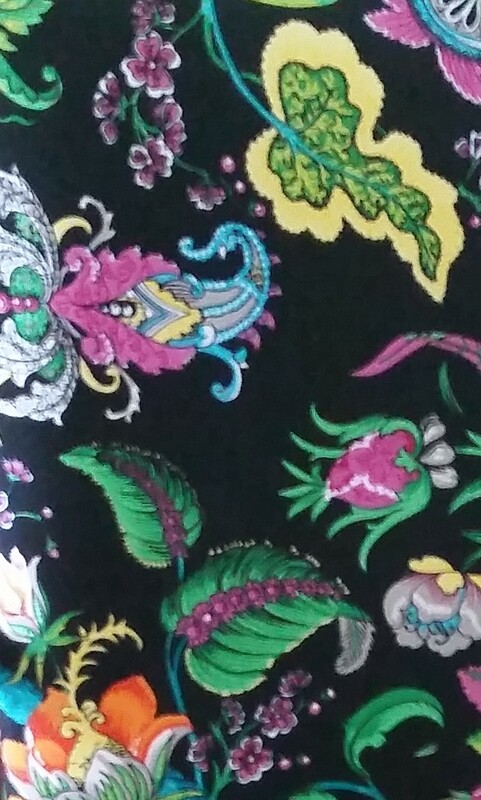 I saw a gentleman shopping with his wife and they picked up this fabric and it was only then that I noticed it. Whilst at the counter with my other selections they asked if there was 15 metres left on the roll, there wasn’t so they decided against it. Their loss however was my gain and I walked away with 4 metres which was more than enough for this piece. I went with View C as I thought it would be more versatile. It took me a while to work out how the neckline pieces went together but I got there in the end. I had to make a few alterations in the end as the size I decided on was too big for me in the bust, shoulders and waist length. The dress isn’t lined and has a facing. Something I will rectify should when I make this again. I’m really happy with how it turned out and I think it goes really well with this red cardigan my Mum knitted for me. 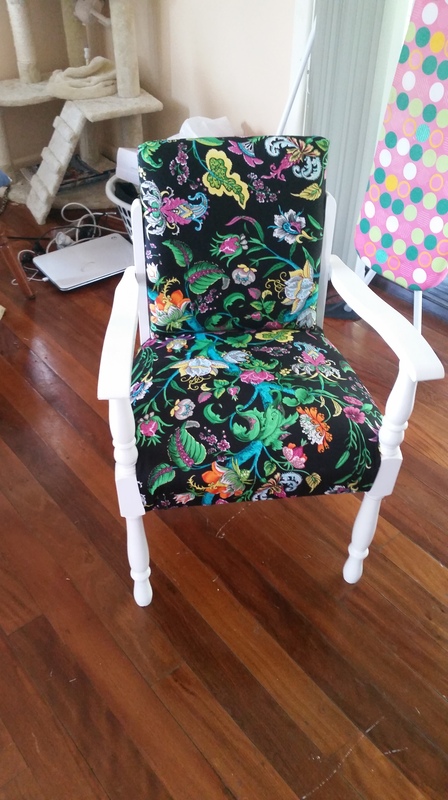 In my last post I detailed the upcycling of my new/old desk chair. 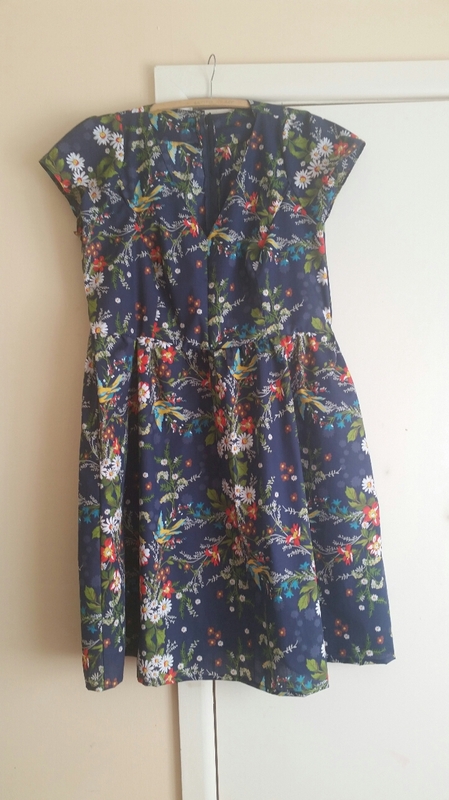 I loved the fabric and when I decided to make up Butterick 6089. I had picked view B and figured it would be a great work dress. 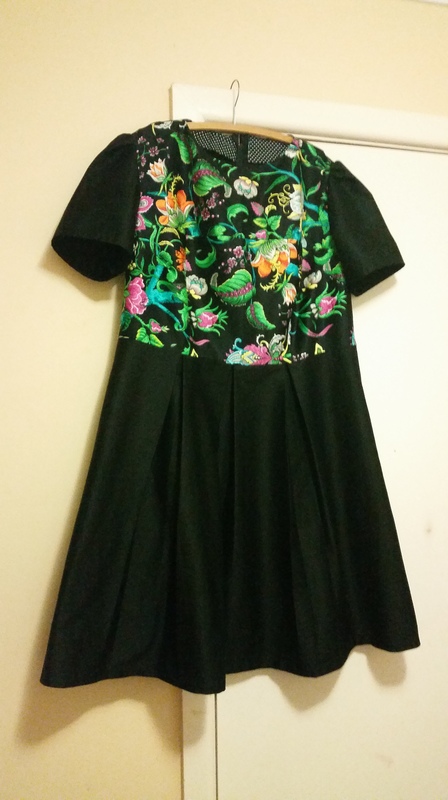 I had picked my fabric and decided on a basic black cotton sateen. In the cutting out process I realised that my basic black would be too boring for my liking I rummaged through my small pieces pile and came up with this. I had just enough to cut out the front panels in the bright cotton sateen. The process of putting it together was pretty straight forward. I decided against lining the dress, mostly cause the process of lining was mildly terrifying. I ended up making some facings. I have a habit of using contrasting fabric where you can’t see it so I decided some black and white polka dot fabric would be perfect. I had to make some alterations to the patterns to fit me. I had to put some extra bust darts in, shorten the waist (I’m high waisted) and bring the shoulders up so they sat right. It didn’t take long to put together and paired with black stockings and a black jacket makes a great addition to my working wardrobe. Some days you stumble upon a piece of fabric that you know you love but can’t for the life of me think of a specific purpose in which to use it. Well, the day I saw this black batik print I knew I had to have it, but didn’t have anything in mind. 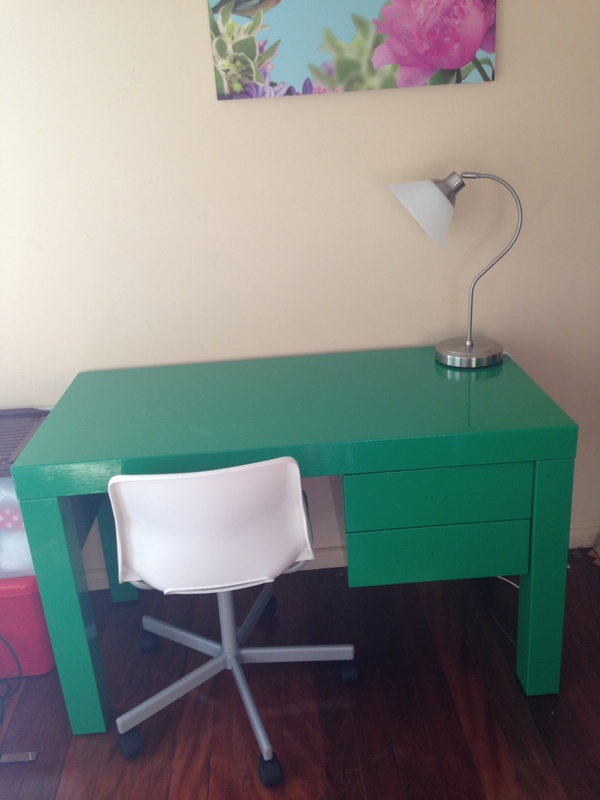 When I figured out how I wanted to decorate my sewing room and that I needed to find something bold enough to work with my delightful emerald green enamel painted desk, I thought I had hit the jackpot. I picked up the desk at a local auction house. It was originally a mahogany stain. I sanded it lightly and then applied the enamel paint directly onto the desk. I applied two coats over three days, enamel paint takes a while to dry. It is also important to remember that you can’t use enamel on a damp day which when you live on the north coast, is a rather rare occasion. I found a great old chair at a secondhand auction house and picked it up for $30. I figured that a coat of white enamel paint would work well with the fabric and contrast with the desk. The first job was to take the original fabric off. It took several hours with some pliers and a butter knife. I made sure to keep the older fabric to use as a pattern for my new cover. I sanded the varnish off the chair and then used two coats of a primer undercoat. Due to time limitations I did all the painting over a few weekends. I then applied four coats of the white enamel to make sure I got the perfect gloss white. After the painting was complete and left to dry and cure for a few weeks I ironed out the old fabric and used it as a pattern. I used a staple gun to secure most of it in place. 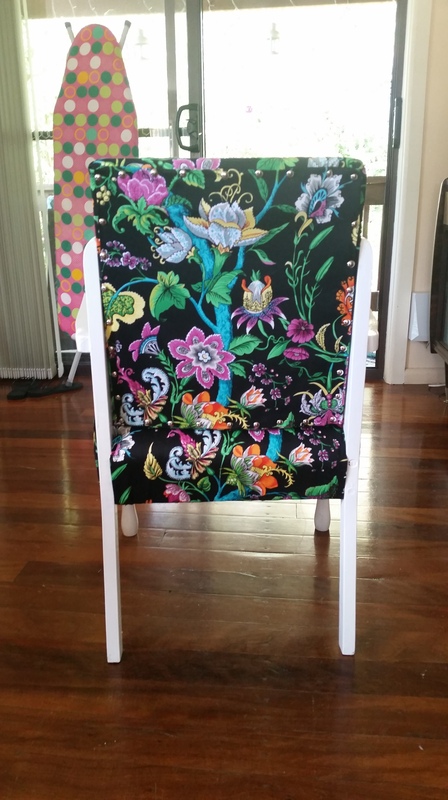 The last piece of fabric on the back of the chair was secured using upholstery tacks to keep that new vintage feel. All in all I am stoked with how it turned out. 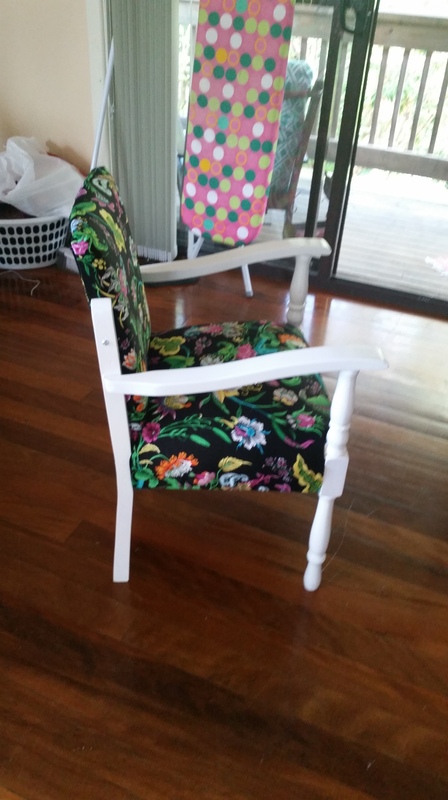 Front view of finished chair. I’m a third generation creator. My Grandmothers were avid crochet and sewers and my Mother is an amazing quilter and seamstress who is patient enough to attempt to teach me to sew over the telephone (she lives 500 kilometres away). I live with my partner, also called Sam and our two cats Ruby and Kratos in regional NSW. By day I work as a lawyer but my other passion is sewing and food. 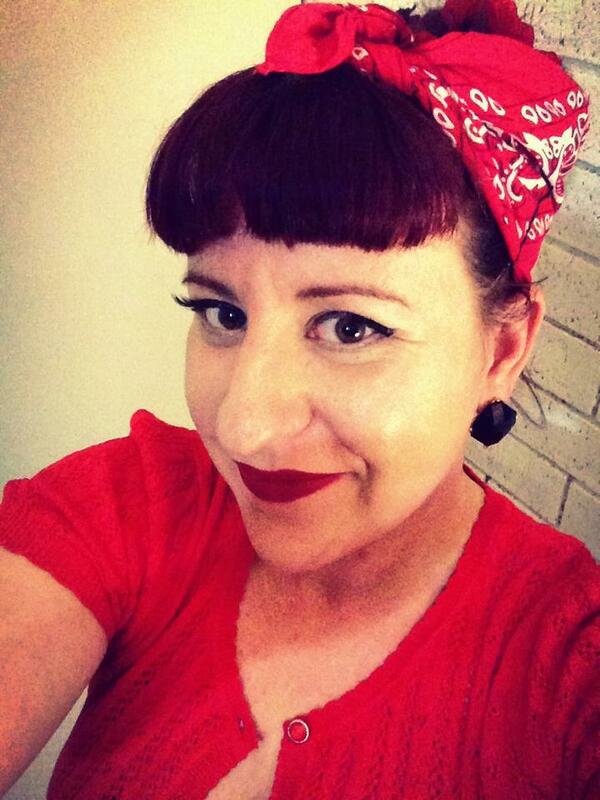 My Dad’s mum ran an op shop for fifty years and my favourite memories are hunting for treasures in their storeroom. It was here that my love of vintage started, fuelled by my families visits to Wintersun it has now exploded. 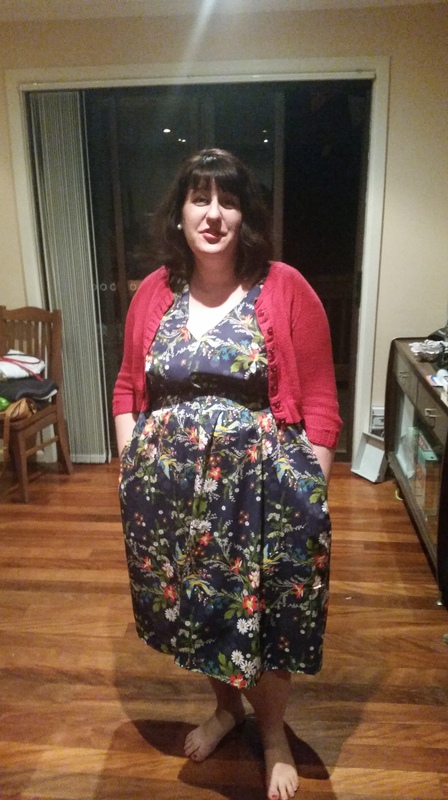 I have a natural curvy figure and I love nothing more than popping on a vintage inspired frock. Thanks for stopping by and I hope you enjoy my ramblings.